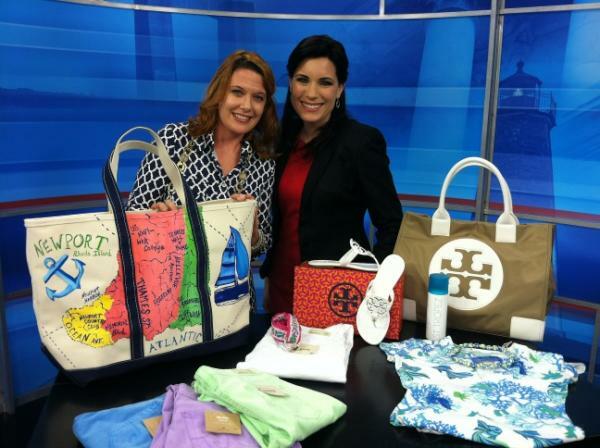 I headed to The Rhode Show this morning with some posh picks for the fashionable traveler. Whether you’re jetting off to St. Bart’s this spring break or just want to look like you are, there are some fabulous spring trends that are beginning to bloom. First you’ll want to consider smart, travel friendly pieces that are light and durable—in addition to being beautiful. 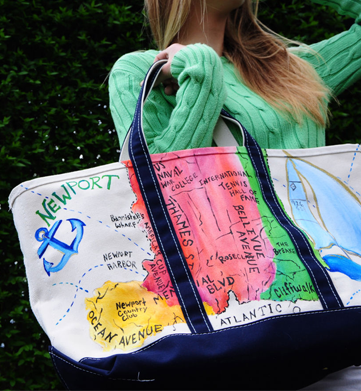 Turn heads when you’re sporting a one of a kind amazing tote by Francesca Joy. 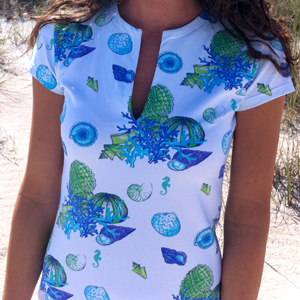 Designer Elise Francesca hand-paints each piece and with every component made in the USA. Size, styles and prices vary, but Rhode Show viewers can get an exclusive discount by shopping at http://www.etsy.com/shop/francescajoyPB and entering RHODESHOW at check out. Colored denim is all the rage for spring and you’ll find varying lines pulling out all the stops offering everything from preppy pastels to unapologetic bold hues. We’re featuring these super soft AG Stilt skinny ankle jeans in cerulean, lemon lime and lavender today, but they come in a rainbow of colors at Laura Jean Denim. In contrast, a crisp white pair of AGs is essential for summer. Pieces that are low maintenance and simple to pack like this Manuel Canovas curve hugging dress from Angela Moore are a fashionable traveler’s best friend. It’s stretchy, ultra light, takes up almost no space in your suitcase, and is multi-functional. Be the chicest on the beach or pair it with a great shoe and derby hat and you’re off to an al fresco lunch on Miami’s Ocean Drive. Also, leave the high-price bling at home for safe keeping and opt for whimsical jewelry pieces like this signature Angela Moore beaded necklace with Swarovski crystals. A great flat will carry you a long way and the Tory Burch Miller sandal in white patent leather from Michael Hayes pairs easily with shorts, dresses, skirts and of course, your crisp white skinnies. 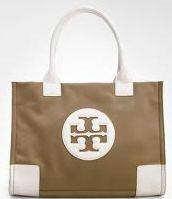 If you’re crazy for Tory Burch and want the world to know, the Ella tote is nylon and therefore durable, but more importantly, is a fabulous carry all for when you have limited space in the overhead. Finally, if you aren’t tropics-bound but want to fake it to you make it, or if you just want to practice safe sun, St. Tropez sunless tanning products from The Apothecary will make you look like you just you just returned from the exotic island. Stay tuned for a link to The Rhode Show posted here! On set with the lovely Mary Larsen! Entry filed under: Uncategorized. Tags: AG Stilt skinny ankle jean, AG Stilt skinny ankle jean sale, Angela Moore, Angela Moore Newport ri, colored denim spring 2012, Elise Francesca, Francesca Joy, Francesca Joy discount, Francesca Joy Newport tote, Laura Jean Denim Newport ri, Manuel Canovas, Manuel Canovas appoline, Manuel Canovas dresses, Manuel Canovas Newport RI, Manuel Canovas sale, Newport Rhode Island, St. Tropez sunless tanning, The Apothecary, The Apothecary newport ri, The Rhode Show, The Rhode Show Andrea McHugh, The Rhode Show Newport Stylephile, Tory Burch Ella tote, Tory Burch ella tote Newport ri, Tory Burch Miller sandal, Tory Burch sale, Tory Burch spring 2012.